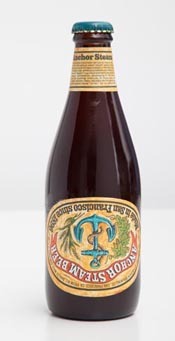 After the 1989 earthquake Anchor Brewing bottled beer with upside-down labels. If someone at Anchor Brewing is interested in a six-pack of these unopened bottles that could be used to display I would like to donate them. Contact me if you think you may be interested and we can make arrangements for you to get the six-pack. I reached out to Melba, who was excited that this six-pack of “Earthquake Beer” was finally coming home. I thanked her for her generosity and encouraged her to let me know the next time she was in San Francisco. The beer and its six-pack carrier arrived by mail in perfect condition. A few months later, Melba brought a couple of friends to the Anchor Brewery for a tour. We had one of the bottles from her six-pack on display in our taproom. Not many of us remember where we were on April 18, 1906. But those of us who were in the San Francisco Bay Area on October 17, 1989 have vivid earthquake memories of that day. At Anchor, our brewing day began at 5 AM as usual, with four brews (we call batches of beer brews) of Anchor Steam on the schedule. Everyone at the Brewery was looking forward to Game 3 of the World Series that evening, featuring our hometown Giants vs the Oakland A’s from across the bay. When the quake hit at 5:04 PM, the Brewery rocked but, miraculously, not a single bottle fell from its perch. Brewer Richard Gossett calmly noted the time on one of the brewcharts. The power went out of course, as it did throughout much of the City. And we had two brews in the brewhouse. Without electricity, our third brew of the day was trapped in the brewkettle and our fourth, fully converted and ready for transfer to the lauter tun, was stuck in the mash tun. Fritz Maytag, who was still at the Brewery, used his car phone to call his wife on her car phone. Both were OK, although from the brewhouse windows the City looked dark and foreboding. A few employees who lived nearby came in to see if everything was all right and have a beer to calm their nerves. Richard and assistant brewmaster Mark Carpenter volunteered to wait it out until the power came back on. In those days, it took two to shovel the lauter tun. Both lived across the Golden Gate Bridge and neither knew if they would be able to get home that night anyway. Finally, at 9:45 PM, the power came back on. By that time, we already knew that neither brew was going to turn out like Anchor Steam, but why not finish both and transfer them to their original destination, open fermenter #6? At 4:11 AM, Richard noted that the beer was “ALL IN” and headed home. A month later, even though it did not look or taste much like Anchor Steam, we just couldn’t resist bottling our “Earthquake Beer.” It was Fritz Maytag’s idea to turn the labels upside-down. But there was no press release, no press conference, no fanfare. We just shipped the beer. Fritz figured that if someone had a question or concern, they would certainly call the Brewery. They didn’t. Word got out, though, and lucky Anchor Steam fans like Melba ended up with a six-pack of “Earthquake Beer,” brewed on October 17, 1989. If you lived in the Bay Area in 1989 you will remember the earthquake that rocked the area. The earthquake disrupted not only the lives of many but also the beer-making process at Anchor Brewing. At the time, who knew that an upside-down label on a bottle of beer would become a topic of conversation? Shortly after the earthquake a friend who worked at Star Grocery in Berkeley brought me a six-pack of Anchor Steam Beer with upside-down labels. To our knowledge, the labels were turned upside down to designate that the beer was bottled after the earthquake and distributed to several Bay Area merchants. It seemed like a good idea to keep a commemorative item from the earthquake that rocked the San Francisco Bay Area. But at the time, I certainly had no intention of keeping it for 25 years! That six-pack was a topic of conversation. I displayed it, told stories about how it was bottled to commemorate the earthquake and one day I hoped to taste it. Over the years, it made many moves with me. Following my move from the Bay Area to Arizona, it got placed on a garage shelf, safely packed away in a box and forgotten until 2014 when I rediscovered it. 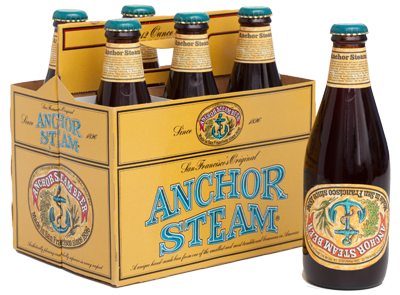 I debated whether to open a bottle to taste it or to contact Anchor Brewing to find out more about the beer. It dawned on me that the beer might be special to Anchor Brewing and of more value to them than me. 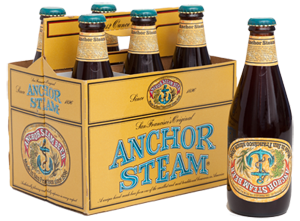 I made the decision that if Anchor Brewing would accept the six-pack, then I would gladly ship it back to them. After all it didn’t belong on a garage shelf but “home” at Anchor Brewing. Thank you Dave Burkhart for accepting my offer. He gave me a little more information about the beer and why the labels were turned upside down. Was my six-pack the real thing? It was! How did we know for sure? In those days, before government warnings, UPCs, born-on dates, and back labels, we had a special way of coding our bottles. First, we notched bundles of our oval face labels like a clock face: December at 12 o’clock, January at 1 o’clock, etc. 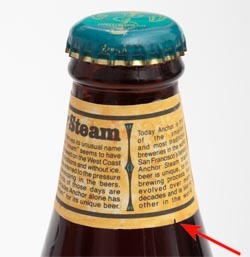 The notch on the face label of “Earthquake Beer” tells us that it was bottled in November. The neck labels were also notched. 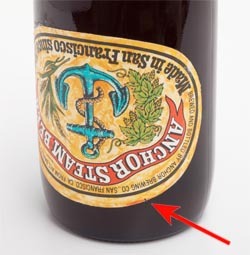 The position of the notch or notches on the neck tells us, in the case of our “Earthquake Beer,” that that bottle was from the sixth bottling of Anchor Steam that month. The little drawings in our bottling book (thank you Chris Solomon!) confirm this. On a recent tour of Anchor Brewing I saw a bottle of my “Earthquake Beer” displayed on a shelf in the Anchor taproom. I got to tell my story about the beer with the upside-down labels and how my six-pack of upside-down-labeled bottles from 1989 is finally home! Thank you Melba! We’re raising a (fresh!) 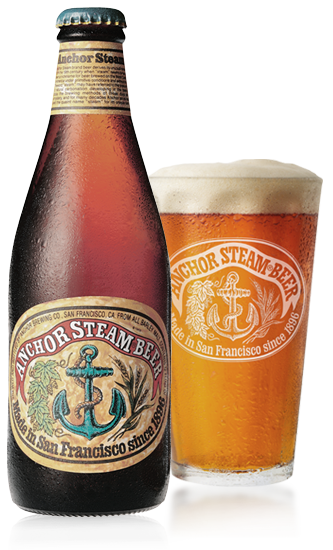 glass of Anchor Steam to you and to all those who were here for the quake of ’89! You guys should make a commemorative earthquake beer and distribute it. I’m curious to what it tasted like.